Birthday, New Baby, Anniversary, New Home – these are just a few of the reasons to go floral! Flowers are the final touch for any occasion, adding colour, mood and perfume. Every event is unique and our flowers are tailor-made using seasonal flowers to suit both the occasion and the setting. We offer a consultation for every wedding well ahead of the Big Day, to really understand the look and feel you want. Wether your wedding is small and intimate or on a larger scale. The first thing is to give us a call so we reserve your date. An initial consultation can be over the phone if you’re planning your wedding in Cornwall from afar. Let’s make the party swing! As with weddings we offer a consultation ahead of the party to understand exactly what you want and suggest ideas if you’re not sure! 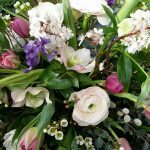 There are lots of ways to add flowers to an occasion and we will work with your budget to suit the day. The first thing is to give us a call so we can check and reserve your date. An initial consultation can be over the phone if you’re planning your party in Cornwall from afar. At such a difficult time we strive to make our flowers a real tribute and consolation. 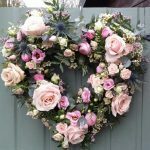 Individual designs which aim to reflect the life of a loved one, sympathetically created to include favourite flowers / colours for their last ceremony. Based in our fabulous West Cornwall studio with views to the sea. We offer a range of half and full day workshops to suit the seasons and for all levels of ability. 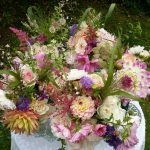 Using the best flowers and foliage, with small classes and refreshments to include delicious local produce. 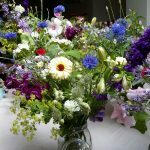 Spend time being creative and release your inner florist! We publish our workshops each season on social media, or contact us to receive e-mail updates.